Evaluations are the cornerstone of your patient care plans. Without them, treatment would be guesswork and patients would not have the opportunity to build trust in your expertise. Shouldn’t the same, analytical approach apply to your business? That’s why we, your “Marketing Therapists” have prepared the PT Advertising Checklist. Take a minute to evaluate these 5 checkpoints in your advertising plan. If you aren’t satisfied with your results, or “range of motion,” implement your treatment plan immediately. Browse below or Download the Complete Infographic Here. 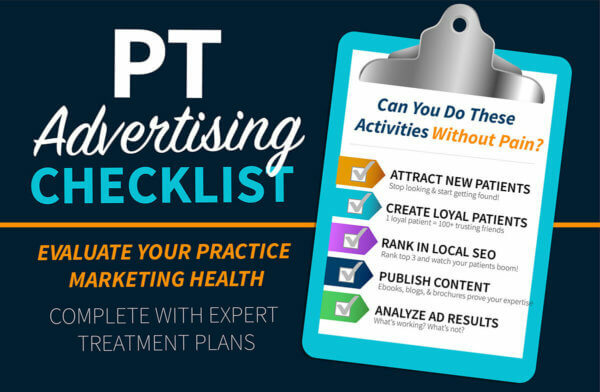 The PT Advertising Checklist: Can you do these activities without pain? First, Does Your Practice Attract Enough New Patients? Have all the new patients you can handle? Or is finding new patients a pain point that eats up your time? Create specific materials for patient and physician referrals. Publish a variety of helpful, informative print brochures and newsletters to advertise locally. Create Ebook downloads on pain relief and treatment to generate email leads. Second, Does Your Practice Create Loyal Patients? Keeping people coming back isn’t expensive, but you have to be personal and willing to stay in touch with them. Here are some “exercises” you can use to strengthen your loyalty muscles! Post & engage on social media daily. Set up automated, regular email campaigns. Create impressive, branded welcome packets. Provide referral cards for friends and family. Third, Does Your Practice Rank Top 3 in Local SEO? Local SEO is an incredible PT advertising tool. As a local place of business, you have the opportunity to appear in Google’s local search radius without having to fight nationwide competition. This simply requires a well-optimized website and up-to-date business listings through Google, Yelp, & others. To get an edge, use a listing distribution system to keep accurate info across hundreds of listing apps from one place. Keep accurate business listings across all possible websites & apps. Encourage Google reviews via reputation management software. Need more SEO and keyword advice? Check out this blog for PTs. Fourth, Does Your Practice Publish Helpful Content? Consider a PT blog writing service. Utilize social scheduling software to plan ahead. Create marketing materials with condition-specific pain relief tips. Create or order custom, branded ebooks. Utilize a PT newsletter system. You’re doing great! Stretch, catch your breath, just one more area to check off. Lastly, Does Your Practice Analyze Ad Performance? Know the 5 key performance metrics for PT. Use an analytics dashboard to track ads in one place. Utilize email automation to track results while saving time. Keep your patient email list up to date. Create a marketing funnel or consult a PT advertising expert. It is normal to feel a little sore after a first treatment. But I assure you, with a little work, your practice can advertise like a pro and do so pain-free. Save the infographic below & follow our blog or Facebook for more tips!